Every year, people I work with eagerly await my Halloween costume, or should I say creation. I do not like buying my costume, and take a lot of pride in creating as much as I can from scratch. My 2013 costume idea arose from an innocent comment made by one of my friends. 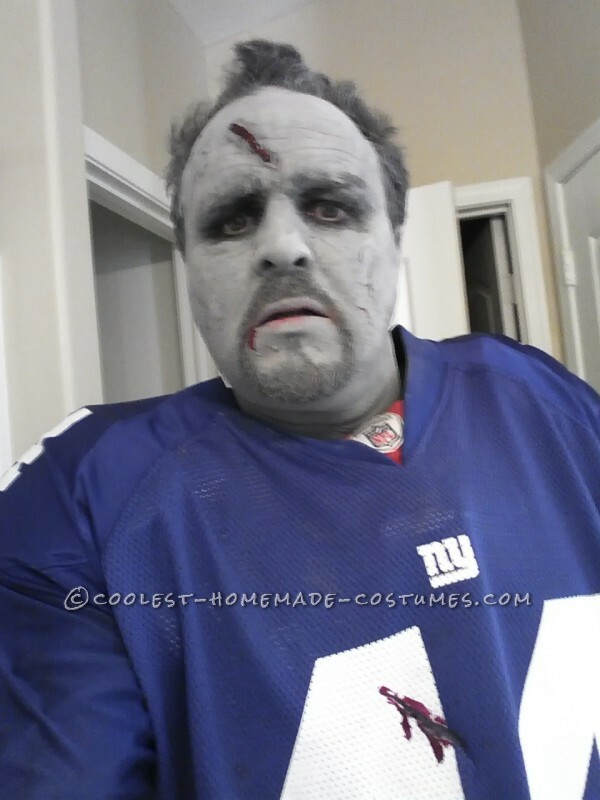 I am a die hard NY Giants fan and last year they simply sucked. I am also a big fan of the TV show, The Walking Dead. Well, last year, one of my friends made the statement that the Giants appeared to lack any life. That’s all it took for the wheels to begin turning. I joked around about them being the walking dead! 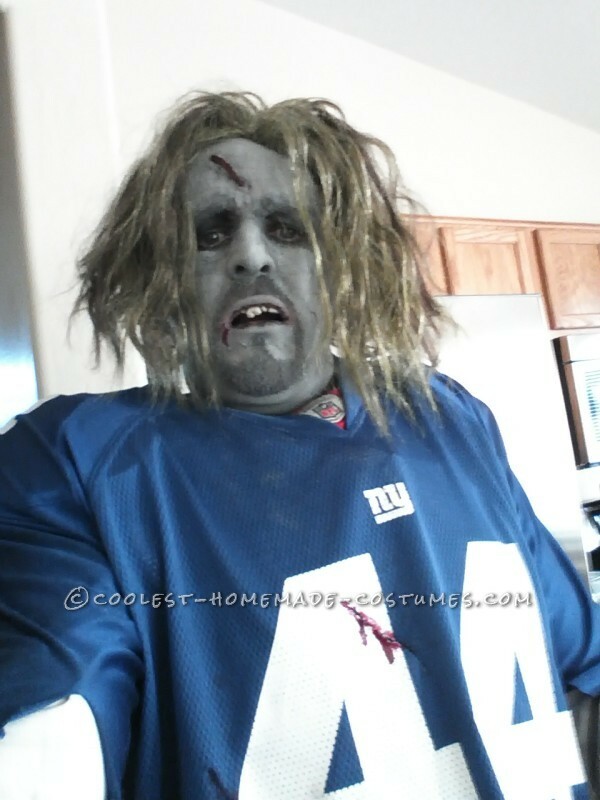 This immediately gave me the idea of a NY Giants zombie. 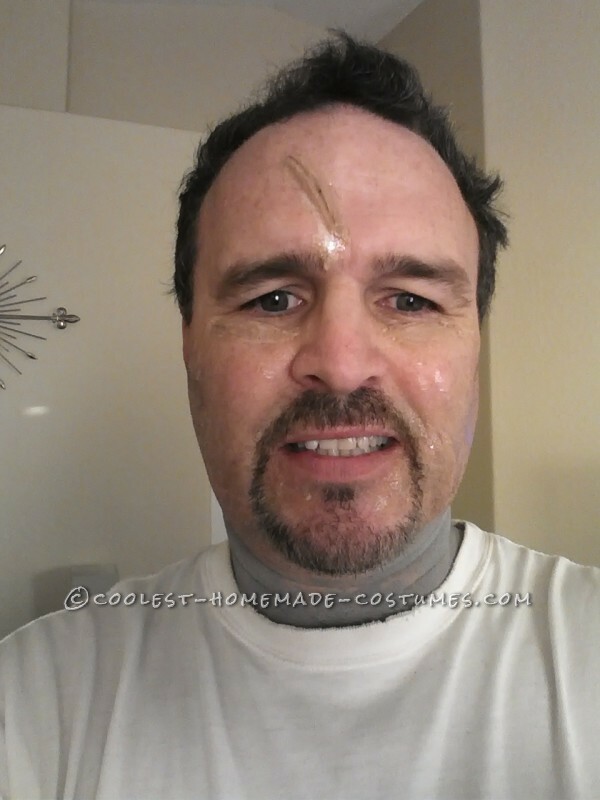 I loved this idea but had to be careful because the costume I would be worn while doing my driving route. I had to be very careful not to cross any lines, but I thought that incorporating sports would reduce the ZOMBIE effect! 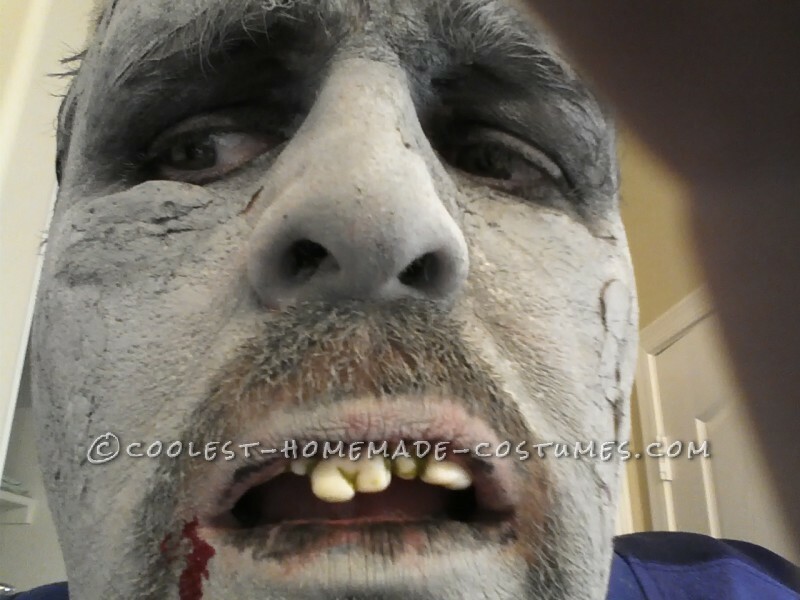 My zombie outfit had to be authentic. 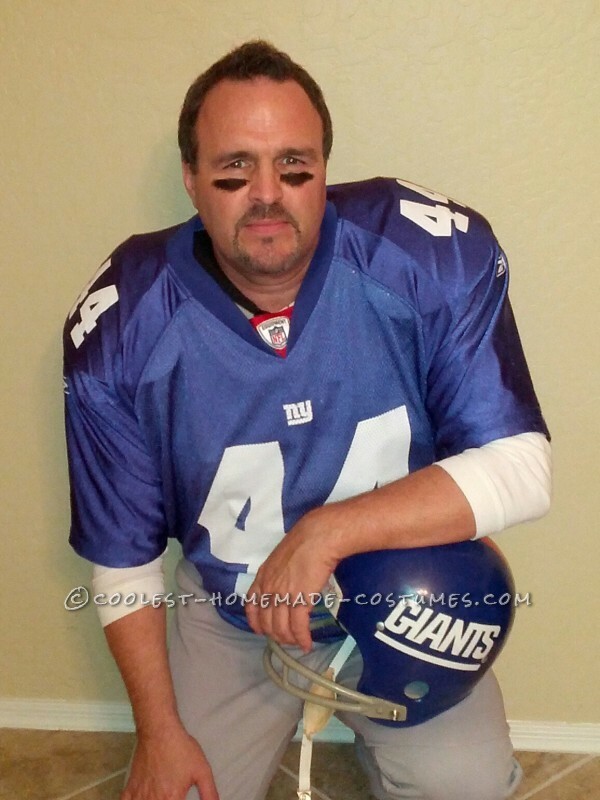 I had the Giants jersey already, but I had to come to grips with the fact that I would have to “rough” it up a bit. I went to a local thrift shop and bought a cheap pair of football pants and was lucky enough to find a pair of shoulder pads. I had an old pair of plastic spikes which would do the trick. Now I had the outfit, but it was too nice a clean looking. To give the uniform a more authentic look, I tied it to the bumper of my car and drove all around the back streets (at night) and on a couple of dirt roads. Mission accomplished. Now the uniform had dirt and scrapes all over it. The next part hurt, I needed to put some assorted slashed on the jersey and pants. Being a die hard Giants fan, it killed me to cut up my only jersey, but I did it for my craft! Once the cuts were in place, I added a little blood to each cut, actually dark red nail polish! 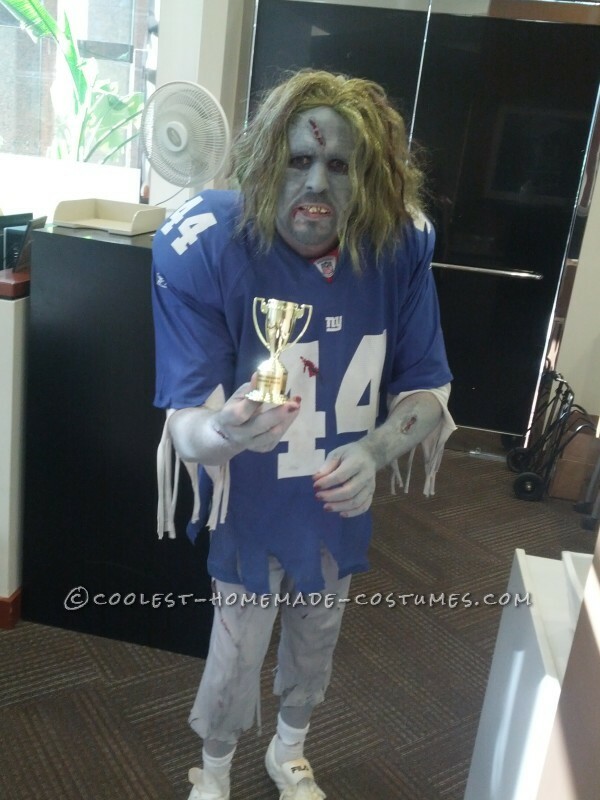 Halloween morning brought the major work, the face, hands and legs….. yes, legs, you see the bottom of the football pants were tattered so some of my legs would be visible (by design). First I used some costume fake skin to create a few scars, legs, arms and face. 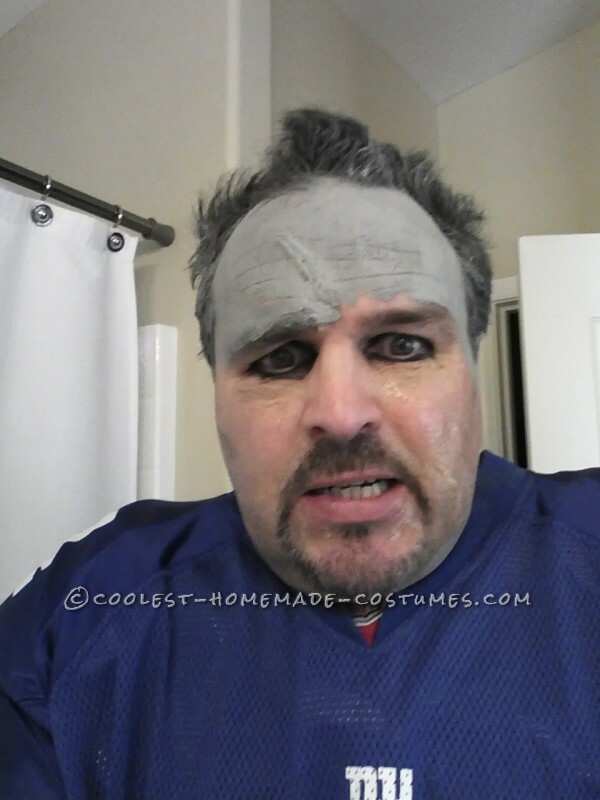 Next I applied the grey skin color to all exposed skin. The hair was something I already owned, an old Joker wig from a costume a few years earlier. I still needed to add some blood to my scars, so out came the dark red nail polish. The final piece was a set of fake teeth. 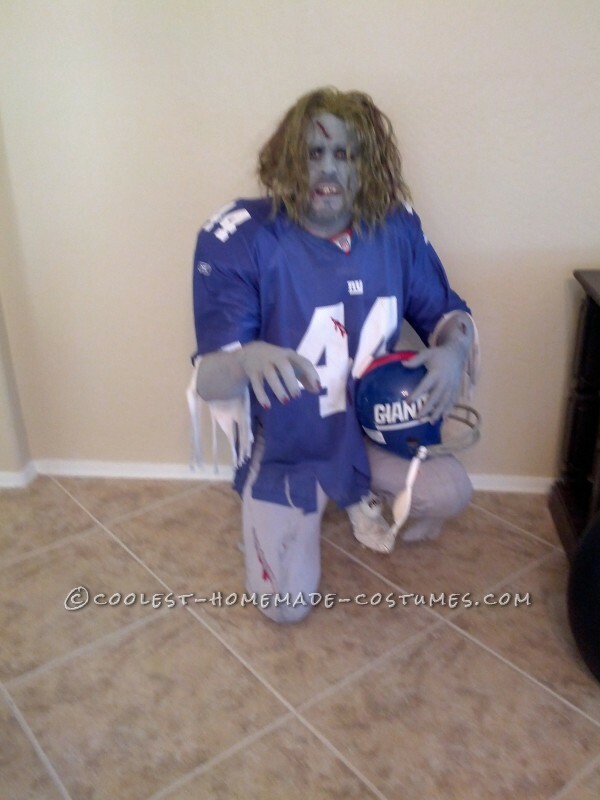 With the Giants Zombie assembled, it was now time to start my route. 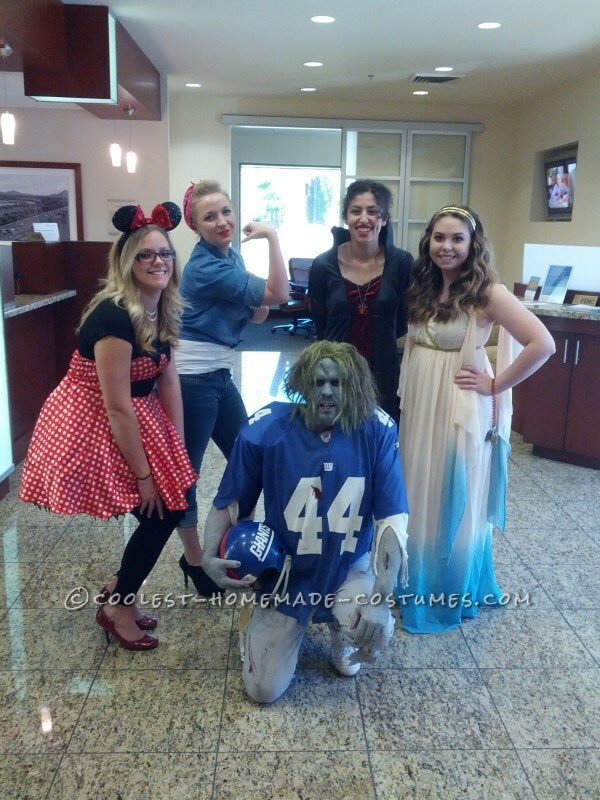 What fun it was to walk into each business all decked out. The reactions were terrific. About half of my customers wanted pictures with me, and none of them recognized me until I spoke. The reaction back at my place of work was even better. I was worried how my bosses would react, but they loved it. My contest won a contest we had in our branch. Then I entered for our business complex (3 high rise buildings) and won there too. When I went to my corporate offices, the receptionist insisted on dragging me around and showing me off. 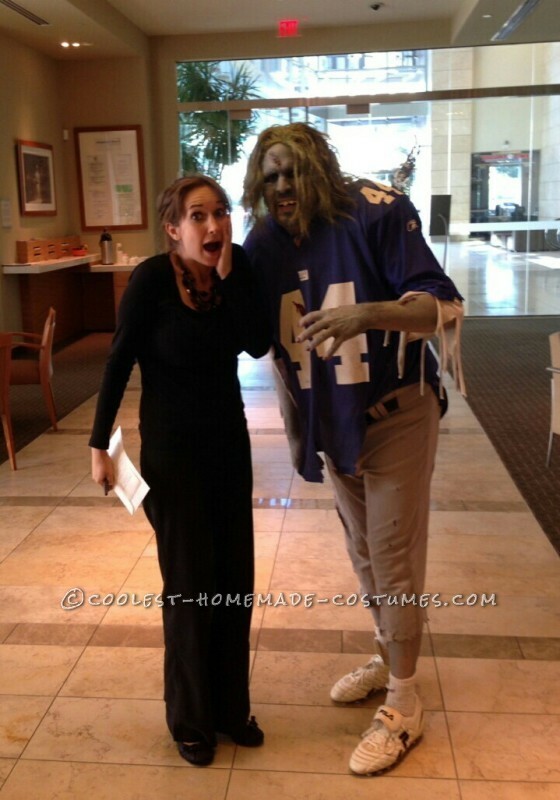 The Giants Zombie was a big hit, and it was fun spending more than 10 hrs dressed up and getting reactions…… but now, what would I do to top it!